The Christliches Gemütsgespräch was one of the most popular catechisms among the Mennonites of Europe and America. It was drawn up by Gerhard Roosen of Hamburg-Altona, and first published in 1702 when its author was 90 years of age. (Whether he wrote it then or earlier is not known.) Twenty-two editions were known by 1950 but most likely more editions were printed. In Europe six editions came out between 1702 and 1838, while North America by the 1950s had seen eleven German editions since 1769, and five English editions since 1857. The full title of the book runs as follows in English: Christian Spiritual Conversation on Saving Faith and the Acknowledging of the Truth Which Is After Godliness in Hope of Eternal Life (Titus 1:1, 2), in Questions and Answers for the Rising Youth, by Which They May Be Incited and Encouraged to a Wholesome Practice of Life. This book is the first complete German Mennonite catechism in existence. It represents the work of a well-settled denomination of respectable city dwellers who wanted to prove their complete harmlessness and orthodoxy to their non-Mennonite neighbors. Altogether there are 148 questions and answers in 24 sections. One whole third of the text is devoted to the first article of faith, the doctrine of God, demonstrating the creedal strictness of the Mennonites regarding the Trinity and related points. Doctrinal items also prevail elsewhere though softened down wherever possible. No total depravity is taught as in the Prussian catechism. The practical teachings of the Mennonites are but lightly touched; nonresistance is taught on less than one page, and nonconformity is not taught at all. There is no talk of a suffering church. The entire tone is mild, non-provocative, and assimilatory. Roosen had of course certain models to draw from: Dutch catechisms which likewise stressed the doctrinal angle and tried to be non-provocative, and also G. Hansen's Glaubensbericht an die Jugend (1671), which book, however, is much stronger and more uncompromising than the Gemütsgespräch, and for that reason never became as popular as the latter (see Catechism). Yet all these models were just suggestive to Roosen and not actual sources. Hence the Gemütsgespräch must be considered as his original work. Due to its moderation it became more widely used than any other catechism of its size. 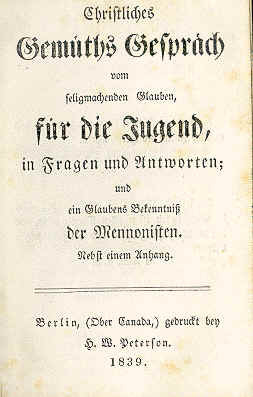 The edition published in Berlin, Canada in 1839 contained an afterword by Bishop Benjamin Eby. This first English translation of the work was under the supervision of a Committee of Canadian Mennonites, and was a translation of the 1839 Eby edition. Roosen, Gerhard, Christian Burkholder, Benjamin Eby, Gerhard Roosen, and Gerhard Roosen. Christian Spiritual Conversation on Saving Faith for the Young: In Questions and Answers. Lancaster, Pa: John Baer and Sons, 1857. Available in full electronic text at http://www.archive.org/details/christianspirit00ebygoog. Roosen, Gerhard, Leenaerdt Clock, Christopher Dock, and Gerhard Roosen. Christliches Gemüths-Gespräch: von dem Geistlichen und seligmachenden Glauben, und Erkenntniss der Wahrheit, So zu der Gottseligkeit führet in der Hoffnung des ewigen Lebens. Lancaster, [Pa.]: Gedruckt bey Johannn Bär, 1869. Available in full electronic text at http://www.archive.org/details/christlichesgem00unkngoog. American editions are listed in Harold S. Bender, Two Centuries of American Mennonite Literature: a Bibliography of Mennonitica Americana 1727-1928. Goshen, Ind. : Mennonite Historical Society, 1929. Friedmann, Robert. Mennonite Piety Through the Centuries: its Genius and its Literature. Goshen, IN : Mennonite Historical Society, 1949: 144-147. Hege, Christian and Christian Neff. Mennonitisches Lexikon, 4 vols. Frankfurt & Weierhof: Hege; Karlsruhe: Schneider, 1913-1967: v. II, 66. Roosen, B. K. Gerhard Roosen, weiland Prediger der evangelischen Mennoniten-Gemeinden zu Hamburg und Altona, geb. 1612, gest. 1711, geschildert. Hamburg, 1854. Friedmann, Robert. "Christliches Gemütsgespräch (Monograph)." Global Anabaptist Mennonite Encyclopedia Online. 1953. Web. 20 Apr 2019. http://gameo.org/index.php?title=Christliches_Gem%C3%BCtsgespr%C3%A4ch_(Monograph)&oldid=155562. Friedmann, Robert. (1953). Christliches Gemütsgespräch (Monograph). Global Anabaptist Mennonite Encyclopedia Online. Retrieved 20 April 2019, from http://gameo.org/index.php?title=Christliches_Gem%C3%BCtsgespr%C3%A4ch_(Monograph)&oldid=155562. Adapted by permission of Herald Press, Harrisonburg, Virginia, from Mennonite Encyclopedia, Vol. 1, pp. 585-586. All rights reserved. This page was last modified on 30 October 2017, at 15:41.